The holidays are right around the corner, and for those who will be hosting family and friends throughout this busy season, now is the time to begin sprucing up your home for the holidays. Along with making sure your guest bedrooms are ready to welcome visitors, you’ll also want to make sure your kitchen and bathrooms are in shape, too. 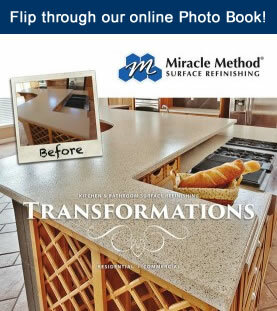 Updating your kitchen and bathrooms is a quick and painless process when you choose to refinish with Miracle Method. We can typically complete the work within a two to three day time frame, which means your space will only be out of commission for a few days, as opposed to a few months if you were to remodel. 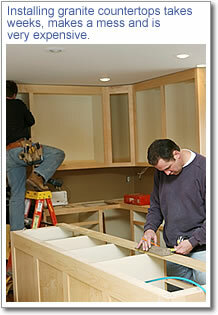 Plus, refinishing can extend the life of your existing bathroom and kitchen fixtures by up to 15 years or more. Additionally, we offer a variety of color options, so you’re sure to find the perfect fit for your kitchen or bathroom’s new and improved look. Our Natural Accents stone colors are a very popular choice, as they have the multi-color appearance and the texture of a natural stone, but for a fraction of the cost. 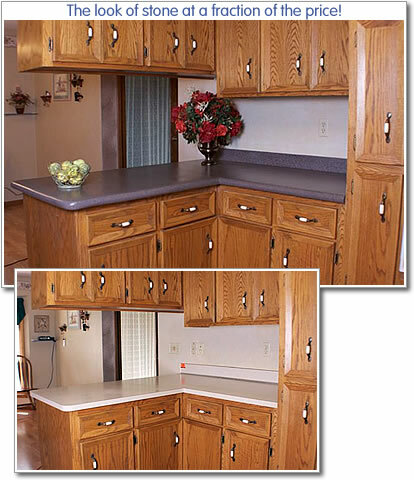 Our Natural Accents product is a great alternative to replacing your countertops. Miracle Method offers a cost-effective and timely approach to updating the appearance of your kitchen or bathroom in time for your holiday visitors. Visit our online locator to find a Miracle Method franchise near you, or call 855-212-7337. Granite countertops have become quite common in high-end homes over the years. Granite comes in a variety of color options and with so many unique patterns, granite countertops easily become the focal point of kitchen remodels. This natural stone product is also quite durable, which is another reason so many remodelers and interior designers like to use it. However, granite is a rather expensive material that can cause the price of a kitchen remodel to skyrocket. There’s very little room for error when working with granite, and granite countertops require regular maintenance and care to ensure that they continue to look good. If you find yourself debating whether or not to choose granite countertops for your kitchen, take a look at some of the pros and cons of granite countertops to help you make your decision. It is also resistant to cuts and scratches. Natural stone patterns create a one-of-a-kind look. Granite is a porous material, meaning there are small holes in this material that are prone to harboring bacteria. Granite is the most expensive option compared to other countertop materials. Granite can be stained or discolored by common items such as citric juices. It can be difficult to match the seams between the slabs of granite. Granite is difficult to repair if damaged which can leave costly replacement as the only option. As a natural stone, a few granite varieties contain high levels of radiation and radon. For those who have determined that granite isn’t the right option for their kitchen, Miracle Method offers a cost-effective alternative called Natural Accents. This high-tech coating offers the wonderful look of stone that many desire, but without the expense and maintenance that granite requires. Visit our website to learn more about this great alternative for your countertops. The countertop on the right has been refinished with Natural Accents. Would you be able to tell the difference between a Natural Accents countertop and a natural stone countertop? Can chipped and scratched laminate countertops be repaired? If your laminate countertops look as if they’ve been used as a cutting board, don’t fret, Miracle Method can repair and refinish them so that they look like new! Laminate countertops are often the right choice for kitchen worktops because they are non-porous, easy to clean, stain and heat resistant, and economical. Over the years, however, countertops can become scratched and chipped leaving them looking downright pitiful. This is where Miracle Method comes into play. Rather than trying to paint the countertops with enamel or latex paint yourself, it’s better to leave the process to the professionals. Here why: Miracle Method professionals will thoroughly clean the surface, repair cuts and chips, apply a special bonding agent and then apply several coats of high tech acrylic finish. This leaves your countertops looking like new and lasting for many years with normal care and cleaning. With refinishing from Miracle Method, you also have the choice of an almost unlimited color and pattern selection, including our Natural Accents stone-look finishes. And the best part is that you will save as much as 30% – 75% compared to the replacement cost of laminate, solid surface, or granite countertops. 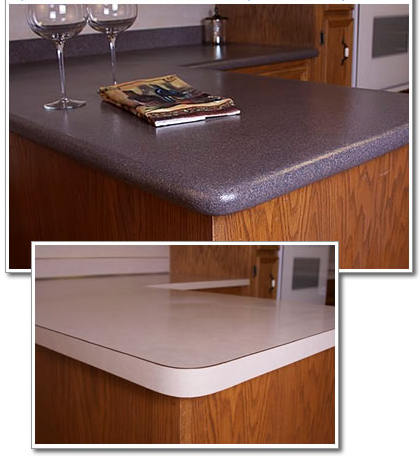 If you’re interested in having your laminate countertops refinished, contact Miracle Method today at 855-212-7337 or visit our website at www.miraclemethod.com. How can I get rid of the square edges on my countertops? How about trying a bullnose or other custom edge design? Doing so will transform your counter into a trendy, modern-looking kitchen design. And nowadays, it seems as if squared edges on counters have an old fashion appearance and “can quickly date the age and appearance of your kitchen or bath” (Miracle Method). Refinishing those edges will have your counter tops looking just as new as replacing it (and isn’t as expensive!). Wouldn’t you like for your counter edges to look like this? If you would like to see other samples of round or customized edges by Miracle Method, call 888.271.7690 and schedule an appointment with a specialist. Is white the only color available for refinishing my bathtub? The answer is “no”….Miracle Method offers white, almond, and biscuit as standard colors, but also offers custom color matching. In addition, only Miracle Method offers Natural Accents which are unique, stone like finishes that will dramatically and quickly transform your bath or kitchen. Click here to see samples of Natural Accents. We understand that your design options shouldn’t be limited when updating your bath or kitchen. White is clean and simple, but the growing trend is towards more color, not less…and especially towards earth tones. You can now say goodbye to your outdated countertops and your pink tubs…..and say hello to our beautiful Natural Accents product that looks like natural stone. Our Natural Accent stone look is quickly becoming a hot trend in the remodeling industry and can be applied to your tile bathtub surrounds, tile showers, bathroom tile floors, and even your kitchen countertops! The color options available are endless so give one of our many Miracle Method locations a call at 855-212-7337.